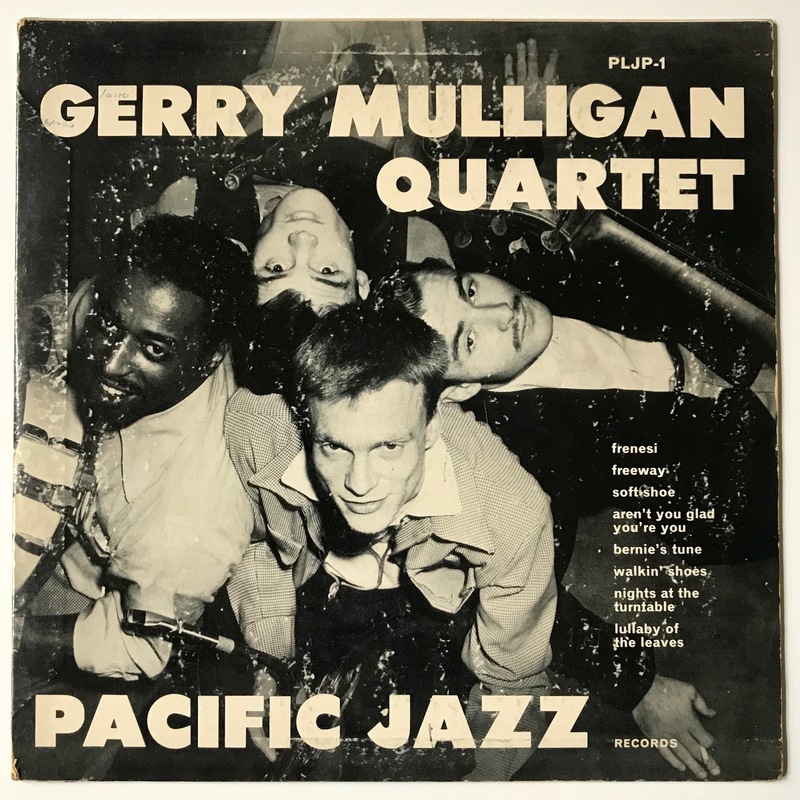 This record marked the fruitful beginning of both Gerry Mulligan’s West Coast piano-less sound and the Pacific Jazz Records label. Both would do much to popularize the laid-back, more academic sound of jazz that blew in from the Coast. All of that began in 1952 with this album. Quite simply, this album and the music on it is classic. The music was revolutionary for 1952, and it still sounds fresh today. In fact, so classic is the music that Allknowing Allmusic gave the album a rare five stars. Ken Dryden’s review says it all. So I’ll let him say it. Amen to that. Mulligan described Baker’s trumpet as a “…warm, fluid sound”. Amen to that, too. Because of this album, “Bernie’s Tune” became much more popular, and is still strongly associated with Mulligan and Baker. Opening the album, it set the tone for the rest of the record. Baker’s spare, lyrical trumpet matched with Mulligan’s husky baritone sax provide all the melody and harmony while Whitlock’s bass establishes the underpinnings of the music. Chico Hamilton’s brushwork keeps things moving. “Walkin’ Shoes”, the first tune featured above, is a Mulligan original that has a head-bobbing beat with a jaunty melody. The thing I love about the track though is how Hamilton somehow misses the beat during Mulligan’s solo break, resulting in the drums being like a beat and a half ahead of the rest of the band. It sounds like Hamilton knows something is off, as he continually tries to get back on beat. He doesn’t get back on time until the middle section, and it’s amazing to hear how the the rest of the group manages not to get thrown off by the wonky time. For whatever reason, they kept the take instead of re-doing it. Maybe they liked it, too. “Freeway” is an original by Chet, and it definitely captures the feeling of driving on a California freeway, from the syncopated intro to the fleet tempo. Chet Baker’s trumpet work here is fantastic, especially considering he was playing by ear. Like wow. Mulligan’s statements are equally impressive, and before we know it the song is over. None of the songs are over three and a half minutes long, needing to all fit on a small record. You don’t really miss the piano on these tracks. 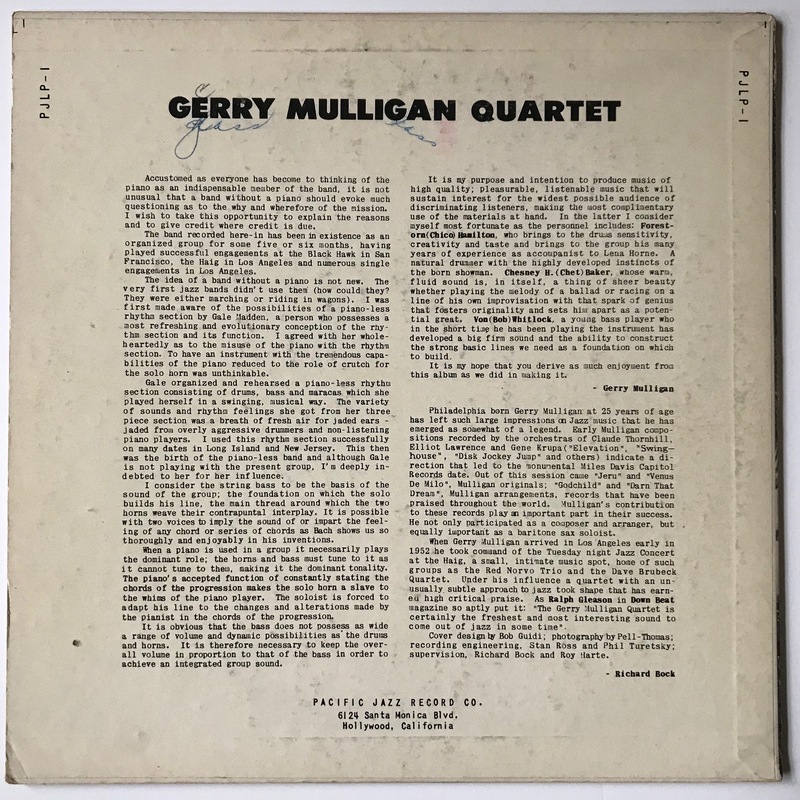 Paul Desmond was a huge fan of both Gerry Mulligan and his piano-less quartet sound, and later fulfilled his desire to both replicate the format on his own record date and record with Mulligan. This piano-less format would become a more common instrumentation as the 1950’s marched on, with everyone from Lennie Niehaus and Sonny Rollins to John Coltrane and Don Cherry recording without the help of a piano. Richard Bock’s debut record on his new label made an artistic and social statement. The photograph that makes up the cover is visually interesting, taken from above as the fellas in the group gaze up at the camera. Each guy is holding their instrument (and in the case of the bass player, a cigarette) and is arranged facing all the points on a compass. There’s a different facial expression on each face, which I find intriguing. Chico is the only guy grinning outright, while Gerry has a mischievous look. Young Chet’s smoldering matinee looks are already evident, while Bob’s blank stare is hard to decipher. Is he just a nonplussed kind of dude? Is his bass hurting his leg? Has the cigarette begun to burn his finger? Questions that need answers! The font and word design is also neat. Simple, no frills, with the important info in all caps and enlarged. The words frame the gentlemen, although I’m not sure why the tunes on side two are listed first. Add to the mystery the incorrect record number in the top right corner. PLJP? Is that code for ‘please listen, jazz people’? Another cool point for the cover art is the fact that Chico is prominently featured. Jazz has always been a much more tolerant and inclusive field amidst the hate and ignorance that was (and is…) America, and this was especially visible during the first half of the 20th Century. Integrated jazz bands weren’t seen as crazy and wild by jazz fans and musicians, but it’s still cool to see a blatant example of it so early in the 50’s. And man do they look young. 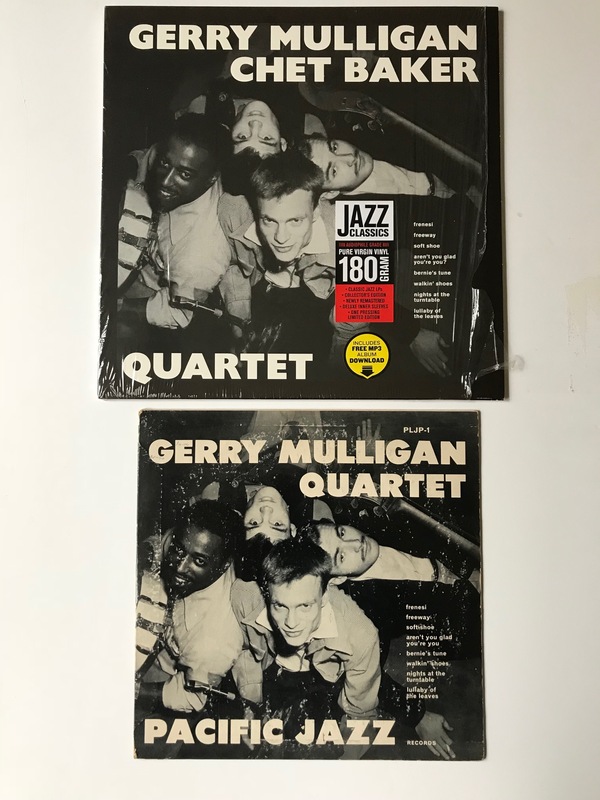 Gerry Mulligan was only 25 (!) while Chet was just 23 (!!!). Pell-Thomas and Bob Guidi, fantastic job on the cover art. There’s ring wear, but then again this record is closer to 70 years old than it is to 60, so that’s excusable. The courier, typewriter font is kind of hip in my opinion, as well as the minimalist design of the back in general. Both Mulligan and Pacific Jazz founder Richard Bock take a whack at the liner notes, and both do a solid job. Mulligan describes his approach and inspiration for the piano-less sound (more on that later), as well as a brief bio on each of his fellow bandmates. 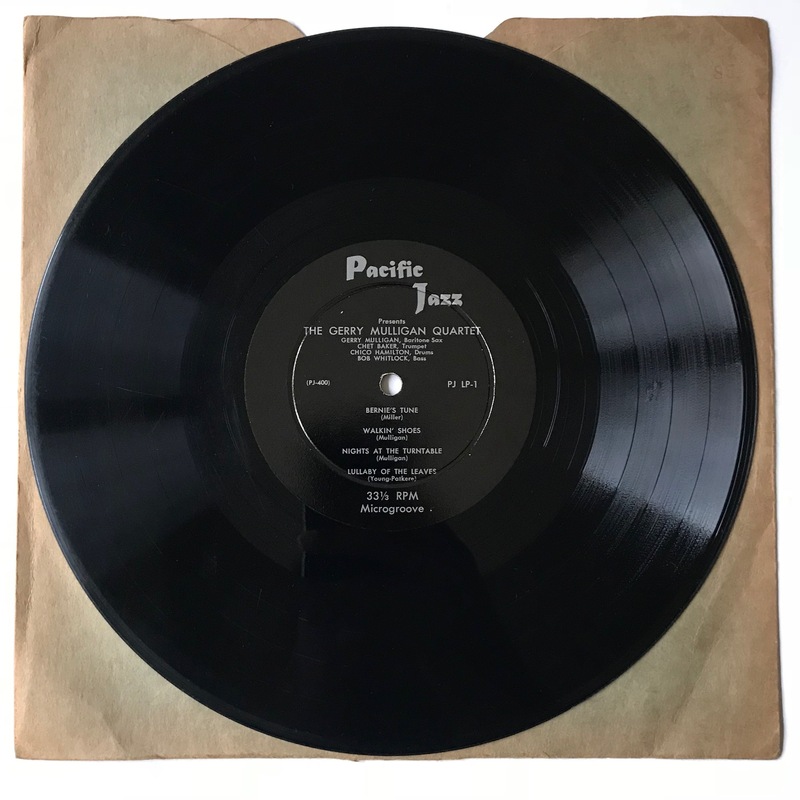 Despite goofing on the front cover, the record number correctly appears on the top sides of the back as ‘PJLP-1’. That address is so Californian, when I put my ear to the cover, I can hear the ocean. The cover itself is solid cardboard with glossy laminate. I love those old early 50’s record covers. Built to last. Refreshingly simplistic labels for the new record company, pressed on thick and heavy vinyl with severe deep-groove. This album was released as a 10-inch record, the popular format for music at the time. With this format, there was enough room for about 12 minutes of music on each side. I never understood why 10-inch records became so popular while the larger 12-inch records were out and about. Seemed like you were getting less music than was possible. Apparently the record-buying public agreed; by the time 1956 rolled around, 10-inch records were quickly becoming a faint memory. It’s a rather fascinating story and one that more knowledgeable have explained in detail. One of those people wrote a fantastic piece on fellow jazz record blogger London Jazz Collector’s site, which you should check out. The material on this album (or at least some of it) was combined with two other Mulligan quartet albums and put onto a 12-inch record later in the 1950’s, implying that this 10-inch record was the only way to have all of the original music- and liner notes and cover art- in one place. 10-inch records are pretty cool, especially as pieces of vinyl history. Often times they have music that can’t be found anywhere else. I only have four 10-inchers, and I wish I had more. One interesting thing about these 10-inchers is that the inner sleeves that come with them almost seem to be too big to fit comfortably inside the album cover. I don’t know if that’s because these aren’t their original inner sleeves or what. Thick, brown paper inner sleeves sure do look like they’re original, but I don’t know. In 2014, the Spanish (Barcelona Spanish, not Tijuana Spanish) record label Jazz Wax Records reissued this album as a 12-inch 180-gram ‘audiophile’ record and included nine bonus tracks. I own this version, too, having bought it years ago before finding the original album last week. Having both, it’s rather fun to see and hear how the 1952 original holds up to the 2014 bright-eyed version. Soooooo, let’s compare! Unsurprisingly, the most noticeable difference is the size. Those two inches don’t seem like much until they’re put side by side. From the front, these two albums are basically the same. The cover on the new album is made of thinner cardboard paper and the artwork/liner notes are printed and attached completely differently. I kept the shrink wrap on because I love how the sticker about MP3 download contrasts with the retro cover. There you have it. I’m 99.9% sure Baker was talking about Gale. The picture he paints is a completely different one than the liner notes depict. Doing a bit of research, I discovered a Gail Madden, a woman who used to be a model and was cool with jazz musicians in the early 50’s. She and Gerry were a couple, and she had a sizable influence on him and his music. It was her idea to hire Chico Hamilton as a drummer. I don’t know what the full story is behind all of this, but it’s a rather captivating story. It’s also apparently a sensitive story. On the 2014 reissue, the original liner notes from the 10-inch LP are reproduced alongside the newer liner notes. All references to ‘Gale’ (sic) are omitted, however. Yet another reason to collect not just vinyl, but the early 10-inch records. Despite being a different record label, JWR managed to retain the same type of plain, dark labels. Lastly, let’s compare the sound of the two records. The tracks featured above were taken off of the 10-inch record. Here’s “Freeway” taken off of the 12-inch record. To my ears, the difference between the two records is slight. The 1952 record’s track has more treble, more of an airy sound. The 2014 reissue’s tracks are more full-bodied, more life-like and in the room with you. All it is (I assume) is a little remastering. That’s not to say that the 1952 version is inferior or anything. I like it a lot, and still think it sounds amazing for 1952. In fact, I’m kinda surprised that it sounds so clean and quiet despite being well over 60 years old and having been a popular record. It sounds like the owners gave it a few listens and decided that was enough. What do you think? Which version do you prefer and why? Sound off in the comments! Sometimes the vinyl gods smile on you and give you a second chance. That’s what happened here. Visiting my old California stomping grounds one Christmas, I found the original 10-inch record at the record store. Instead of buying it right then and there, I figured that since I already had the 2014 reissue, why bother with getting the same music on a different format? Yikes. After I got back home to the South, I realized the mistake I had made. Two years later, while checking the new arrivals in the jazz section of the local record store , I saw this album peeking from behind a Brubeck album (also a 10-inch). I couldn’t believe it. I was being blessed with another chance to get the album. This time, I didn’t hesitate. 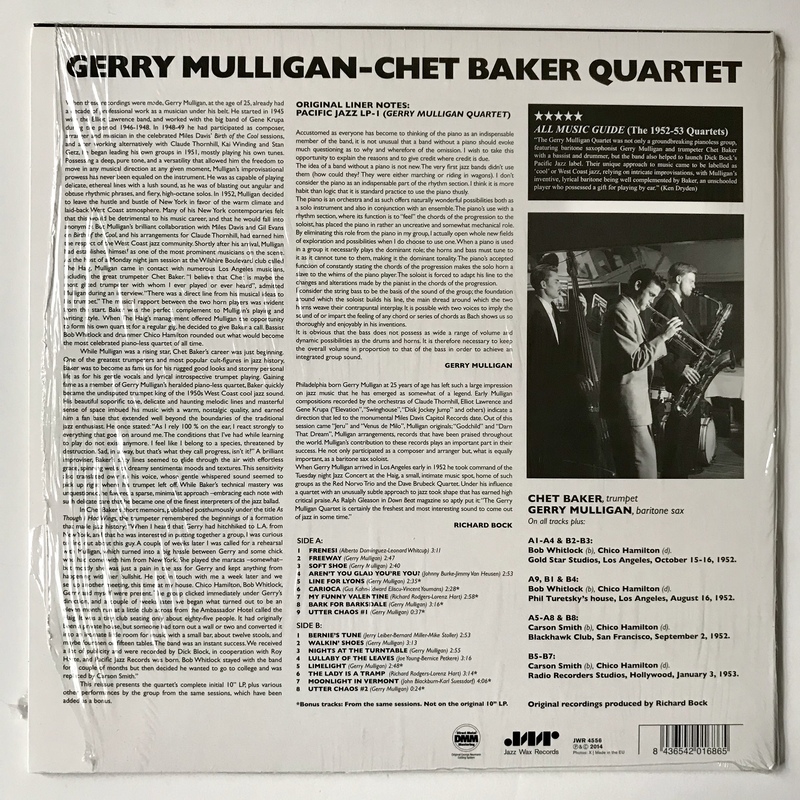 Some trickster (or the original owner) had switched records, putting the Brubeck record in the Mulligan sleeve and the Mulligan record in the Brubeck sleeve, which caused a minor heart attack until I figured it out. At $12, not only was it well within my college budget, it was about $10 cheaper than the one I saw back in California. Good things come to those that wait.